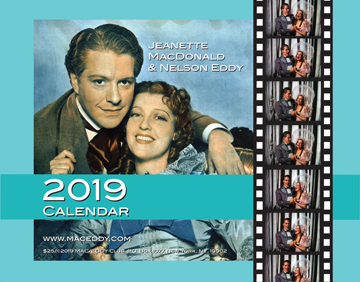 Home / Calendars / Jeanette & Nelson 2019 calendar! Now available! Each month features a different fabulous, glossy photo annotated with dozens of NEWLY UPDATED, interesting, informative and fun dates, facts and events in the lives of Jeanette and Nelson! These make great gifts for yourself or any Mac/Eddy fan! If needed, we can drop-ship a gift calendar for you; just write what the text should say in the “order notes” and we will include a holiday card for them. The calendar cover is another work of art from Don Schumann! Thank you so much, Don!